The G7 leaders have called on Russia to stop all efforts to “annex” Ukraine’s Crimea region. G7 said if Russia took such a step they would “take further action, individually and collectively”. They also said they would not recognize the results of a referendum in Crimea this weekend on whether to split from Ukraine and join Russia. Meanwhile, Ukraine’s national security chief has warned of a major Russian military build-up on Ukraine’s borders. Andriy Parubiy said Moscow had not withdrawn its troops after carrying out military exercises near Ukraine’s eastern and southern frontiers last month. The Group of Seven industrial nations – Britain, Canada, France, Germany, Italy, Japan and the US – along with the EU urged Russia to “cease all efforts to change the status of Crimea”. “In addition to its impact on the unity, sovereignty and territorial integrity of Ukraine, the annexation of Crimea could have grave implications for the legal order that protects the unity and sovereignty of all states,” they said in a statement released by the White House. 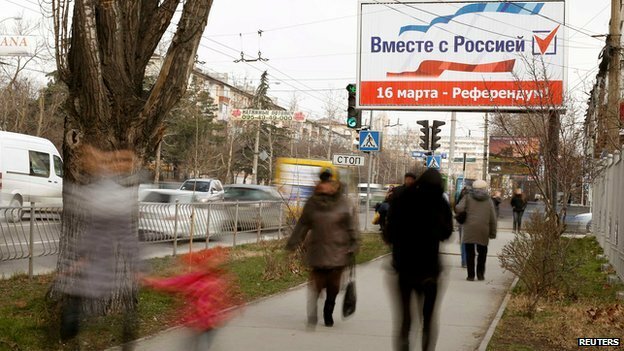 They said Sunday’s referendum, asking the people of Crimea if they want to be a part of Russia or Ukraine, has “no legal effect” as it is in “direct violation” of Ukraine’s constitution. The leaders repeated their calls for Russia to de-escalate the crisis by withdrawing its troops, talking directly with Kiev and using international mediators to “address any legitimate concerns it may have”. US Secretary of State John Kerry says he has been asked by President Barack Obama to travel to London for talks with Russian Foreign Minister Sergei Lavrov on Friday. “Our job is to present them with a series of options that are appropriate in order to try to respect the people of Ukraine, international law and the interests of all concerned,” John Kerry told the House Appropriations Committee on Foreign Operations.